Development of corn ear and kernel rots and associated mycotoxins in grain may have been favored by the dry and hot weather in some areas of Minnesota this summer. Although few problems with ear rots or mycotoxins seem to have been reported so far, only about 12% of corn was harvested in Minnesota as of September 16 and there is much grain to be harvested where potential problems may have occurred. 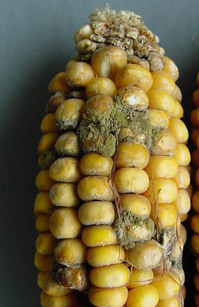 Several different types of ear rots occur in Minnesota, but Aspergillus ear rot and Fusarium ear rot are of greatest concern because they produce mycotoxins and are favored by hot and dry conditions. Aspergillus ear rot can result in production of aflatoxin, a potent mycotoxin that is toxic to animals and humans. 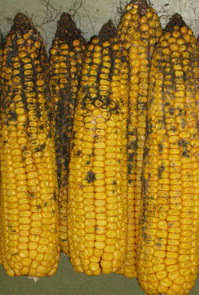 Aspergillus ear rot can become a problem under conditions of low soil moisture and high temperatures greater than 89ºF. It is caused by the fungus Aspergillus flavus that appears as patches of green to yellow spores on or between kernels and can become dark olive green to brown as it ages. It is most common at tips of ears and often only affects a few kernels or small areas of the ear. Aspergillus species can also cause storage rot. This fungus can invade kernels with moisture levels as low as 15%, especially if kernels have been damaged. 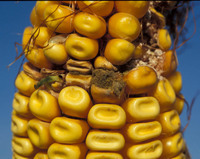 The presence of the Aspergillus ear rot does not mean the corn has high levels of aflatoxin. The grain must be tested to determine how much aflatoxin is present. Different types of screening tests for aflatoxin are available, including a simple black light test that indicates the potential for aflatoxin as well as commercial test kits and chemical methods that measure aflatoxin levels. Grain samples can be tested for aflatoxin and other mycotoxins by the University of Minnesota Veterinary Diagnostic Laboratory (http://www.cvm.umn.edu/vdl/index.htm) as well as other University and private laboratories in the region. Table 1. Action levels for total aflatoxins in livestock feed. Fusarium ear rot of corn is another problem that is favored by hot and dry weather, especially when these conditions occur at flowering. Damaged ears are more susceptible. 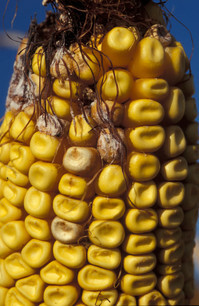 Infected kernels have whitish to pink-colored fungal growth that is often seen at the ear tip, but infected kernels may be scattered on the ear. Infected kernels can also have a "starburst" pattern (white lines radiating out from a point on the kernel) and kernels can also be infected internally with no visible symptoms. The symptoms can differ depending on the corn hybrid, environment, or disease severity. 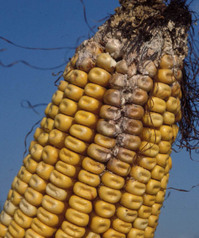 Fusarium ear rot can produce mycotoxins called fumonisins that are also harmful to animals and humans. The FDA has recommended different maximum levels for total fumonisins for animal and human consumption ranging from 1 ppm to 100 ppm for different types and uses of animal feeds. Grain must be tested to determine the levels of fumonisins that may be present. Other types of corn ear rots also occur in Minnesota that are of lesser concern than Aspergillus and Fusarium ear rots because they have not been associated with mycotoxin production. They also often occur under wetter conditions. Two examples are Trichoderma ear rot and Cladosporium ear rot. They are often superficial contamination, don't produce important mycotoxins, and were common in Minnesota a few years ago. Figure 3. Trichoderma ear rot on corn. Figure 4. Cladosporium ear rot on corn. 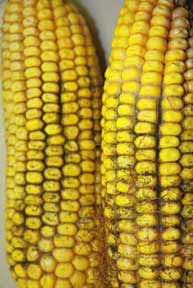 For more information, see Corn ear rots and mycotoxins on the Extension corn website.